Unlike most cars, a good bike is a bespoke collection of components carefully chosen and assembled to meet the the priorities of an individual rider. When finished, my restored bike will be unique, but it should be fairly typical of the kind of bike that a keen long-distance cyclist might have had in the early 1950s. A great source of information on classic bikes of this period is the classic lightweights website. 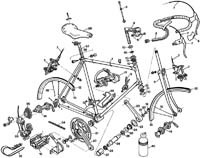 It will not be easy to find all the original 1950s components needed to build a complete, functional bike, so I’ve allowed myself nearly two years to complete the process. I think it may be a close call. The blog will document the process of finding a suitable handbuilt frame and components, of the period, restoring them to “as good as new” condition, and building them into a machine that will carry me the 900-1000 miles between Land’s End and John O’Groats. I hope you’ll enjoy the story.